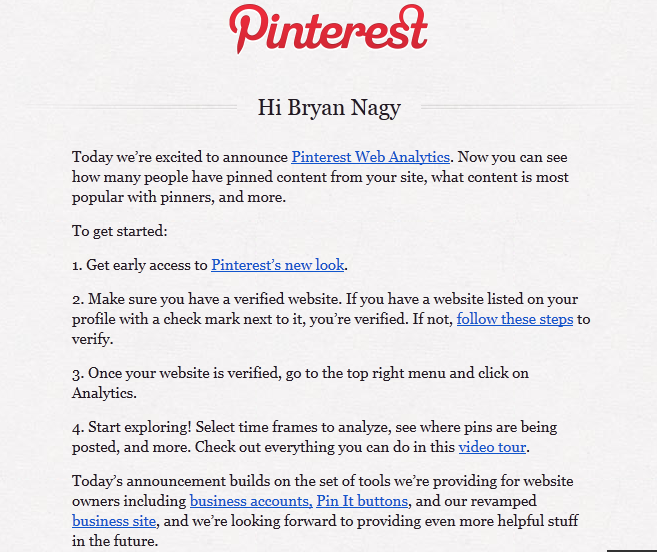 After much anticipation, Pinterest has finally released their web analytics solution. The announcement was made across the web, and also found its way into Business user’s email addresses, as shown below. What is Pinterest Web Analytics? Overall, the Pinterest Web Analytics tool will improve marketers’ web strategy. Knowing what content users are pinning allows them to tailor their website for increased engagement. Images and videos with the most interaction from users (such as those being repinned or clicked on) can be displayed more prominently on the site. Content with less engagement against it can either be removed or placed in less visible areas of the website. Marketers can also begin adjusting content and brand messaging to match those with the most engagement. The tool will also allow marketers to optimize the content they share directly on Pinterest. Insight into pin engagement on their Pinterest boards means marketers can begin pinning content they know users will engage with and shy away from content deemed less relevant. Transparency into who is engaging with the pins can also let marketers know what types of people pin their content. If there are key engagers, marketers can reach out to these users and possibly use them for their overall Pinterest strategy, such as guest pinners or market research. Knowing what type of content the pins are pinned alongside can offer marketers ideas about what other content engagers are interested in. The new Pinterest Web Analytics tool is exciting, considering all of the insights business will be able to get from their Pinterest pag and their website. However, the tool lacks support for users who aren’t looking to tie-in analytics to their website. There are many Pinterest users and businesses who have thousands of followers, but lack a personal website or the ability to add coding to their website (such as myself). These users want the opportunity to get insight into their pins, but simply can’t because of the restriction of the analytics tool. Other social networks off analytics for all. For example, Facebook offers insights to any Facebook page owner, whether or not they’ve verified a website. Despite these restrictions, I’m hopeful that Pinterest will continue to offer additional solutions in the future.